“It is the right time and with the right people” stated H.E. 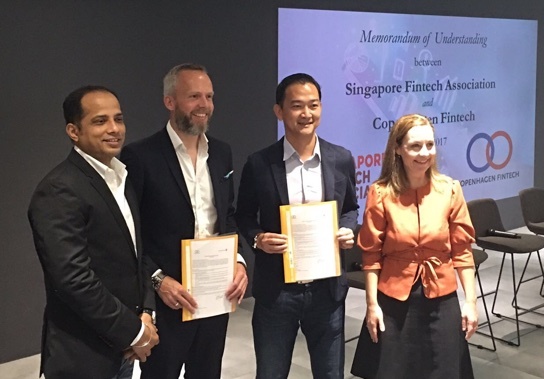 Dorte Bech Vizard, Ambassador of Denmark to Singapore and Brunei, at the signing of the first Memorandum of Understanding (MOU) between Copenhagen Fintech and the Singapore Fintech Association. The event, held in Singapore, is to kick-start the exploratory process between the associations. This includes the potential scope of collaboration, identifying possible roadblocks and building a bridge between Singapore and Copenhagen. Both countries are similar in size and demographics. Each enjoys a straightforward business culture combined with stable regulatory environments. With these characteristics, they may be used as a test bed for solutions and provide access to the wider markets of Europe and ASEAN respectively. Indeed, Sopnendu Mohanty, Chief FinTech Officer from the Monetary Authority of Singapore describe Denmark as “Singapore-like” as it is equally reliable, consistent and a gateway to the region. Similarly, the Singapore Fintech Association also launched in November 2016, with 120 companies now members. The association has active plans to develop the fintech ecosystem through a range of initiatives and partnerships, at local and international level. The first step of this collaborative process is to build bridges that connect Asian companies to European and vice versa. Joining Copenhagen Fintech for the event were representatives from three start-ups – Sophie Blakstad CEO Hiveonline; Simon Ousager Account Executive Chainalysis; Nicholas Meilstrup CEO CrediWire, along with Jan Sirich, leader in Group Digital Nordea. Shailesh Naik, founder of payments solutions company MatchMove, with offices in Singapore, India, Chile and the US identified what he described as the “fundamentals” that made locations attractive. Regulatory regime, the depth and breadth of technical skills and the ability to connect with other countries for outsourcing and access. Denmark has earned a reputation for success in innovation, incorporating human-centric design as an essential element in their approach. Singapore on the other hand is adept at scaling and execution. The combination of these comparative advantages provide a powerful platform for mutual innovation and success.